His Holiness the 17th Gyalwang Karmapa Ogen Trinley Dorje is the head of the 900 year old Karma Kagyu Lineage and guide to millions of Buddhists around the world. Currently 30 years old, the Karmapa resides in his temporary home at Gyuto Monastery in India after making a dramatic escape from Tibet in the year 2000. Karmapa means “the one who carries out buddha-activity” or “the embodiment of all the activities of the buddhas”. In the Tibetan tradition, great enlightened teachers are said to be able to consciously control their rebirth in order to continue their activity for the benefit of all sentient beings. The first Karmapa, Dusum Khyenpa, was born in 1110. He was the first of the great Tibetan masters to establish an incarnating lineage. Since his death in 1193, successive Karmapas have incarnated in this form of manifestation body (Skt. nirmanakaya), for sixteen lifetimes so far, and all have played a most important role in preserving and promulgating the Buddhist teachings of Tibet. Prior to the birth of the first Karmapa, the arrival of a Buddhist master, who would be known as the Karmapa, had been prophesied by the historical Buddha Shakyamuni and the great tantric master of India, Guru Padmasambhava. Throughout the centuries, Karmapas have been the central figure in the continuation of the vajrayana lineage in general and the Kagyu lineage in particular, and have played a very important role in the preservation of the study and practice lineages of Buddhism. In May 2008, His Holiness made his first, long-awaited trip to the West, travelling to the United States where he visited his , and some of the many Dharma centres under his spiritual guidance. In 2011 he visited the United States for a second time, and in 2015, for a third time. As a scholar and meditation master, as well as painter, poet, songwriter and playwright, the Gyalwang Karmapa embodies a wide range of the activities that Karmapas have engaged in over the centuries. As an environmental activist, computer enthusiast and world spiritual leader whose teachings are often webcast live, the Seventeenth Gyalwang Karmapa has brought the Karmapa lineage’s activities fully into the 21st century. 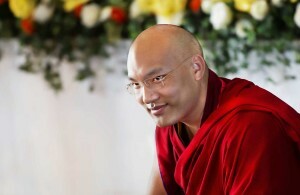 His Holiness the 17th Gyalwang Karmapa is one of the main advisors for KCCL.